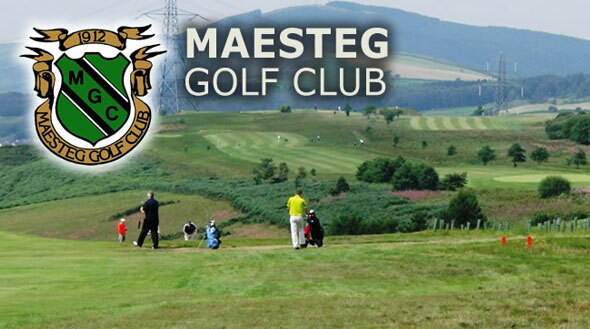 A charity golf day will be held at Maesteg Golf Club on Friday 13th July in aid of Prostate Cymru. Organised by Gareth Holt, Chris Thomas and Kevin Grant, the day will consist of an 18-hole stableford golf competition starting at 10:00am. The annual event is supported by David Brace OBE, President of Prostate Cymru and Chairman of Dunraven Group. The cost to enter a team of four is £120. This great price includes coffee and a bacon roll on arrival, a two course bar meal following the competition and a well stocked half way house providing much needed refreshments during the game. 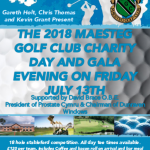 Following the competition, in addition to evening entertainment, an auction and raffle will be held in support of Prostate Cymru. There will also be a prize presentation including prizes for longest drive, nearest the pin, number of lost balls and number of tees in the jar. Earlier in the year, Maesteg Golf Club were presented with a Special Recognition award by Prostate Cymru at the charity’s annual ambassadors lunch at Cornerstone. The club received the award in recognition of the outstanding contribution they make to the charity annually from their commitment to organising a brilliant golf day. 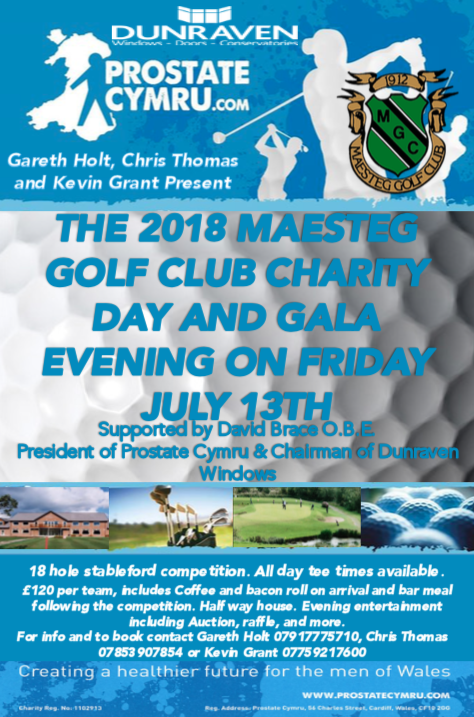 For more information or to book your team in this popular golf day please contact Gareth Holt on 07917 775710, Chris Thomas on 07853 907854 or Kevin Grant on 07759 217600.